I’ve been meditating on Colossians 3:1-4 lately. It’s one of my favorites. In it, Paul instructs us to set our hearts and minds on Christ. In fact, Paul goes on to say that Christ is our life. What does that look like? 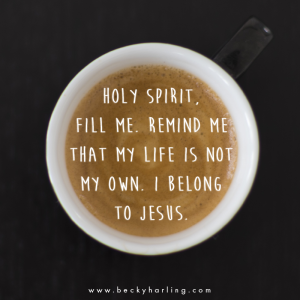 As I’ve been meditating on that passage, I’ve grappled with what it looks like to have Christ at the center of my life. Sarah Edwards, the wife of preacher Jonathan Edwards, centered her life on Christ. What’s remarkable is that she had 11 children! Don’t you wonder how she got anything done? As an evangelist, her husband traveled often, so that weight of raising 11 children fell largely on her. Yet she wanted her life centered on Christ, so she found time to cultivate her relationship with Him. She wrote this about her time in God’s presence: “I was entirely swallowed up in God as my only portion, and His honor and glory was the object of my supreme desire and delight.” Wow! Don’t you wonder how she was able to enter God’s presence so deeply in the midst of raising 11 kids? Begin Each Day by Surrendering to the Spirit of Christ. In our modern world, it’s easy to forget that our journey with Christ should be a walk of surrender. Paul wrote, “You have died and your life is now hidden with Christ in God” (Colossians 3:3). As Westerners particularly, we scream about our “rights.” Here’s the thing: when you chose to follow Jesus, you gave up your rights. Your life is now to be one ongoing act of surrender – His will, His desires, His plans …even when His plans don’t seem fair. It’s so hard to wrap our minds around that! But as I study heroes of the Christian faith, I’m realizing that they understood it – when they followed Jesus it was a call to die. Take a few quiet moments to look deep within. What thoughts fill your mind? Mixed in with positive productive thoughts, you might find resentment, envy, negativity, fear, greed, pride, insecurity, or selfishness. Those negative thought patterns get in the way of the spiritual and emotional transformation that Christ wants to accomplish in our lives. So it’s important to get rid of them – but how? Certainly the Holy Spirit is the primary agent of transformation and purification in our lives. But we play a part as well. Teresa of Avila, a famous woman of prayer in the 16th century, understood this. She wrote about her “interior castle,” saying to her readers, “It is necessary that your foundation consist of more than prayer and contemplation. If you do not strive for the virtues and practice them, you will always be small in the faith.” Spend a few moments reading Colossians 3:5-10. Ask the Lord to uproot negative thinking from your life. Instead, when negativity comes to mind, ask the Lord to re-clothe your mind with the characteristics found in Colossians 3:12. Pause throughout your day and thank Him for the good gifts He’s given you. Play worship music in your home and car, and sing along. Learn to live your life as an act of worship to Christ (Colossians 3:16-17). Fill your phone with worship music that suits your style, and then let it prompt your praise. Friend, the bottom line is that you will have to be intentional if you want to center your life on Christ. But it’s worth the intentionality because Christ is your real life. I’ll be in England this week meeting with many of our world office leaders. Please pray as the videos for Who Do You Say That I Am? are edited, and please pray that many churches will order these videos and use the curriculum for their fall Bible studies.